Dog lovers can pet a pooch, and owners can leave their dog to be doted on for less-than-exorbitant doggy daycare prices at Canvas in Shoreditch until the end of March. Shoreditch Dog House is good for humans too. 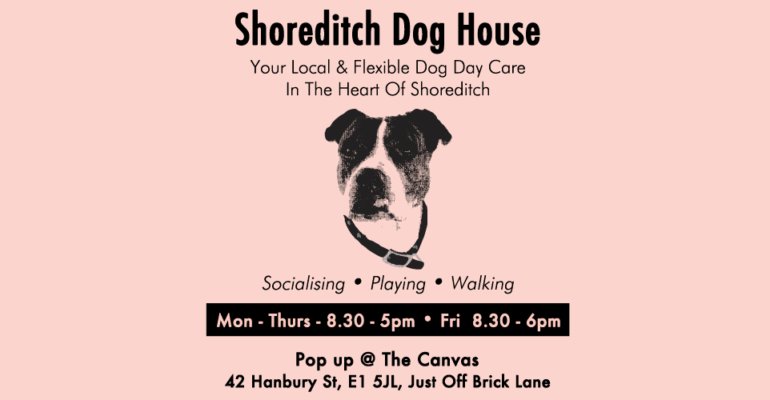 Every hour + your dog spends at Shoreditch Dog House will pay for a hot drink or a meal for someone in need from the Tower Hamlets area. Prices start from £8 for 1 hr to £27 for a full day which includes two walks for your four-legged pal. You can even do DOGA – Yoga for you and your dog, yes it’s a thing!